What if ISIS pulls off the unthinkable and unleashes catastrophic terror attacks inside the erican homeland? The State of the Union address is minutes away. The president of the United States is set to tell a joint session of Congress and the American people that the U.S. is finally winning the war against the Islamic State. But after tracking ISIS from Istanbul to Baghdad to Amman, New York Times national security correspondent J. B. Collins fears the worst is yet to come. ISIS jihadists have infiltrated the U.S. They are planning to launch catastrophic attacks inside American cities that could make the horrors of 9/11 pale by comparison. But Collins has uncovered only part of the story. The full truth may be worse than the American people’s darkest fears. And the consequences may be harder than Collins is prepared to imagine. After ISIS terrorists attack the U.S. Capitol building during the president’s State of the Union address, the entire world waits to see how the most powerful nation on earth will respond. But the Taylor administration is more committed to political correctness than to justice, and it falls to other nations to lead the way in hunting down Abu Khalif, the criminal and religious mastermind who heads the Islamic State. When New York Times journalist J. B. Collins, reeling from a tragedy closer to home, suddenly finds himself in possession of vital information that could help in the search, he is once again thrust into the crosshairs of global politics. But this time it’s personal. As he joins the hunt for the world’s most wanted and dangerous man, his quest takes him from Bar Harbor, Maine, to Tel Aviv to Cairo to Istanbul and beyond. Through it all, he has one goal: find Abu Khalif and hold him accountable for his terrible actions. But the clock is ticking, and more attacks are coming. Will Collins locate the ISIS emir before it’s too late? He will stop at nothing to do so. But at what cost? Joel Rosenberg has become a favorite author of mine. His books are not for the faint of heart, and are always relative to current events. He doesn't pull any punches in regards to radical Islam and the dangers our country faces. 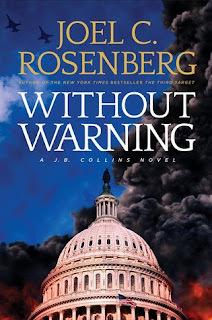 This has been my favorite series Rosenberg has written, and this final book in the J.B. Collins Series is more intense and gripping than the previous two, and that is saying a lot. Without Warning picks up a few months after The First Hostage ended. The attacks on our country are fictional, but it is a very scary look at what could happen here if ISIS and other radical Isalmic groups continue to go undefeated and unchecked. In this novel, the elusive terrorist mastermind Abu Khalif gets personal, and there was things happening that I didn't see coming. As with the other books, the action and dram goes on all over the world as Collins goes from the USA to Israel, Jordan, and other places in the Middle East. Without Warning is 453 pages. I started reading it the other day with no intention of reading much of it. However, the book is so gripping and difficult to put it down, I read the entire book in one evening. I did read a little past my bedtime, but it was worth it. This book is that good. The book/series didn't end as I wished it had. I'll try not to give any spoilers away, but it had an awesome, yet sad ending. I wish Rosenberg could have found a different way to end the book, but it was an amazing ending to this awesome series. In addition to the drama, action , and suspense; Collins' spiritual journey takes center stage, and he goes a long way in his relationship with his brother. This was truly a fantastic series, and I was sad to see it end. I was given a copy of this book by Tyndale Publishing in exchange for my honest review. Without Warning is available from Tyndale Publishing.